3" x 6" high gloss aluminum metal standard size bike plate. Made of the highest quality aluminum for a weather resistant finish. It is lightweight & durable. Pre-drilled holes for quick and easy mounting. Use vinyl letters to personalize your license plate. 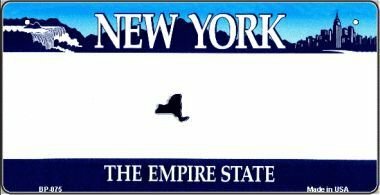 Add a ribbon, wire or string to instantly turn this license plate into a sign and display it on a wall or door. Individually shrink-wrapped and proudly made in the USA. Most orders are shipped within 24-48 hours. If you have any questions about this product by Smart Blonde, contact us by completing and submitting the form below. If you are looking for a specif part number, please include it with your message.